Another high capacity SSD option. 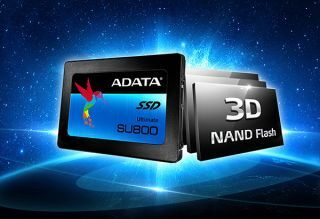 Adata says it wants to offer a full range of solid state drives that utilize advanced 3D NAND flash memory, and eventually it wants to transition its entire lineup over. To that end, the storage player today announced its Ultimate SU800 series of SSDs. Despite the "Ultimate" moniker, the new line is a midrange solution using 3D Triple-Level Cell (TLC) NAND flash memory. It's paired with an unnamed SMI controller and a SATA 6Gbps interface to deliver up to 560MB/s of sequential read performance and up to 520MB/s of sequential write performance, according to Adata's own metrics. "The Ultimate SU800 supports both SLC Caching and a DRAM Cache Buffer to enable variable speed increases based on task load and available system resources," Adata says. The 512GB and 1TB capacities offer the best bang-for-buck at around 27 cents per gigabyte, while the 256GB model isn't too far behind. Adata's value proposition isn't quite as appealing for its 128GB model, but we've moved beyond recommending 128GB SSDs for the majority of users. Adata's Ultimate SU800 series will be available soon at Amazon and Newegg. The drives are backed by a 3-year warranty.